Busch Burs are made of tungsten vanadium steel, have 3/32" diameter shanks and are aproximately 1-3/4" long. They are used primarily with the strait handpieces of flexible shaft machines. The wide variety of shapes and sizes offered is intended to fill the complete needs of anyone with requirement for high quality precision burs. Small Sizes - Sets of various shapes of burs in wood stand. Contains 12 burs - three each ball, bud cone, and inverted cone. Sizes 1, 5, and 8. Shipping weight 2oz. Large Sizes - Sets of various shapes of burs in wood stand. Contains 12 burs - three each ball, bud cone, and hart. Sizes 6, 10, and 14. Shipping weight 5oz. 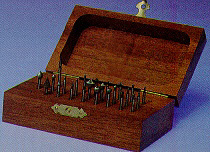 Sets of single shape burs packaged in handy, seasoned hardwood stand. Shipping weight 5oz. each. We have a large selection of Burs. For more information please contact us throught our feedback page, with the size of burs that you need. 1/8" Shank - Consists of 12 double cut 1/8" shank rotary files overal lenght 1-1/2". Wood case measures 3-5/8" x 2-5/8" x 2-1/8". We have a large selection of Carbide Rotary Files. For more information please order our SGS catalog.